This fund raising evening will take place on Saturday 3rd February 2018 @ 6.30pm at 18th Ipswich Headquarters. Fish & Chip supper will need to be ordered and paid for in advance and the bingo tickets will be on sale on the night..
BOOK NOW to get a seat…. More information on GDPR can be found through your preferred search engine. More articles and content will appear over the coming months on what 18th Ipswich Scout Group is doing to ensure our own compliance with GDPR. Wishing everyone very Happy Christmas and a very Happy and Successful New Year in 2018! The Scouts are once again offering their special Christmas postal service for 2017 in the Ipswich and Felixstowe areas. 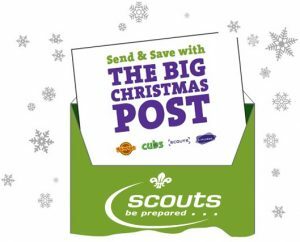 Cost will be only 25p per card (Any Size) – Please put your cards and money together in the special Scout Xmas Post boxes. Please write the full address with postcode and any special instructions on the envelope clearly. For more details, please see below and also at The Ipswich Scout Post website. This service has been provided for 31 years and is now run by eleven scout groups for whom it is a major annual fundraising event, requiring hours of work by the leaders and parents of the Beavers, Cubs, Scouts & Explorers within each group. Plus, of course, a band of dedicated helpers.Scout Groups from Ipswich, Claydon, Kesgrave, Martlesham & Grundisburgh and Felixstowe will be delivering cards in and around Ipswich (Postcodes IP1 – IP5) and Kesgrave, Rushmere, Martlesham Heath, Grundisburgh, Gt and Lt Bealings, Playford, Pinewood, Claydon, Gt Blakenham and Barham. For 2016, Felixstowe have officially joined with the Ipswich scheme to provide a link between the towns and covers Felixstowe itself, the Trimley’s, Walton, Kirton and Falkenham.To find out where you can post your cards please use our “Collection point checker” and to check that we deliver to a particular road please use our “Road Delivery Checker“. This fund raising evening will take place on Saturday 25th November 017 @ 6.30pm at 18th Ipswich Headquarters.